This article is about the novel. For other uses, see Murder on the Orient Express (disambiguation). The elegant train of the 1930s, the Orient Express, is stopped by heavy snowfall, with many passengers. A murder is discovered, and Poirot's trip home to London from the Middle East is interrupted to solve the murder. 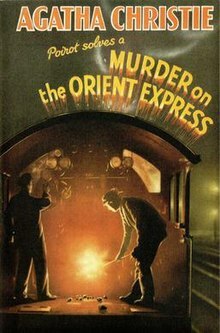 The US title of Murder in the Calais Coach was used to avoid confusion with the 1932 Graham Greene novel Stamboul Train which had been published in the United States as Orient Express. After taking the Taurus Express from Aleppo in Syria to Istanbul, private detective Hercule Poirot arrives at the Tokatlian Hotel. There he receives a telegram prompting him to return to London. He instructs the concierge to book a first-class compartment on the Simplon-route Orient Express service, leaving that night. Although the train is fully booked, Poirot obtains a second-class berth, but only with the intervention of a friend and fellow Belgian who is also boarding the train, Monsieur Bouc, a director of the railway, Compagnie Internationale des Wagons-Lits. Aboard the train, a malevolent, elderly American, Samuel Ratchett, attempts to hire Poirot because he believes his life is threatened, but Poirot refuses out of distaste for the man. In Belgrade, on the second night of the journey, two extra coaches are added to the train and Bouc gives up his first-class compartment to Poirot and moves to a different coach himself. That compartment adjoins Ratchett's. The train is stopped by a snowdrift near Vincovci (sic). Among the several events that disturb Poirot's sleep is a cry from Ratchett's compartment. The next morning, Bouc informs him that Ratchett has been murdered and asks Poirot to investigate. When Poirot and Dr Constantine examine Ratchett's compartment, Poirot finds a trace of a burned note with the words "–member little Daisy Armstrong" on it, which leads him to doubt Ratchett's identity. A few years before, three year-old Daisy Armstrong was kidnapped by a man named Cassetti, who collected a ransom but killed the child anyway. Cassetti was caught but fled the country after he was acquitted on a technicality. Poirot concludes that Ratchett and Cassetti are one and the same. Poirot proposes two possible solutions: Either a stranger boarded the train and murdered Cassetti, or every one of the passengers, all of whom were discovered to have had a connection to the Armstrong case, had all conspired to kill Cassetti together. Mrs. Hubbard – in fact Daisy Armstrong's grandmother – the famous actress Linda Arden, confesses the truth of the second solution, yet Monsieur Bouc and Dr. Constantine choose to present the first of the two to the Yugoslav police. The Times Literary Supplement of 11 January 1934 outlined the plot and concluded that "The little grey cells solve once more the seemingly insoluble. Mrs Christie makes an improbable tale very real, and keeps her readers enthralled and guessing to the end." In The New York Times Book Review of 4 March 1934, Isaac Anderson wrote, "The great Belgian detective's guesses are more than shrewd; they are positively miraculous. Although both the murder plot and the solution verge upon the impossible, Agatha Christie has contrived to make them appear quite convincing for the time being, and what more than that can a mystery addict desire?" The reviewer in The Guardian of 12 January 1934 noted that the murder would have been "perfect" (i.e., a perfect crime) had Poirot not been on the train and also overheard a conversation between Miss Debenham and Colonel Arbuthnot before he boarded; however, "The 'little grey cells' worked admirably, and the solution surprised their owner as much as it may well surprise the reader, for the secret is well kept and the manner of the telling is in Mrs Christie's usual admirable manner." Robert Barnard said that this novel was "The best of the railway stories. The Orient Express, snowed up in Yugoslavia, provides the ideal 'closed' set-up for a classic-style exercise in detection, as well as an excuse for an international cast-list. Contains my favourite line in all Christie: 'Poor creature, she's a Swede.' Impeccably clued, with a clever use of the Cyrillic script (cf. The Double Clue). The solution raised the ire of Raymond Chandler, but won't bother anyone who doesn't insist his detective fiction mirror real-life crime." The reference is to Chandler's criticism of Christie in his essay The Simple Art of Murder. In December 2014, the novel was included in Entertainment Weekly's list of the Nine Great Christie Novels. The kidnapping and murder of Charles Lindbergh's son in 1932 inspired that element in Christie's novel two years later. The film used many elements of the real life case: a young child, firstborn of the family, was kidnapped for ransom directly from the crib, the parents were famous, the father was a well known pilot and the mother pregnant, and the ransom was paid but the child found dead soon after. An innocent, but perhaps loose-lipped, maid employed by Lindbergh's parents was suspected of involvement in the crime. After being harshly interrogated by police, she committed suicide. Two less notable events helped inspire her novel: Agatha Christie's first journey on the Orient Express in late 1928, and a blizzard near Cherkeskoy, Turkey, that marooned an Orient Express for six days just a few months later, in February 1929. Flooding from rainfall that washed sections of track away in December 1931 halted Christie's return from her husband's archaeological dig at Nineveh aboard an Orient Express for twenty four hours. Her authorised biography details that event in a complete quotation of a letter to her husband, which describes several passengers on her train who inspired both the plot and the characters in her novel, including an American, Mrs. Hilton, who inspired Mrs. Hubbard. John Moffatt starred as Poirot in a five-part BBC Radio 4 adaptation by Michael Bakewell, directed by Enyd Williams, and originally broadcast from 28 December 1992 – 1 January 1993. André Maranne appeared as Bouc, Joss Ackland as Cassetti, Sylvia Syms as Mrs Hubbard, Siân Phillips as Princess Dragomiroff, Francesca Annis as Mary Debenham, and Peter Polycarpou as Dr Constantine. In 2017, the streaming service Audible released another radio adaptation that featured Tom Conti as the voice of Poirot. The voice cast also featured Sophie Okonedo as Mary Debenham, Eddie Marsan as Cassetti, and narration from Art Malik. The book was made into a 1974 movie directed by Sidney Lumet and produced by John Brabourne and Richard B. Goodwin; it was a critical and commercial hit. The film starred Albert Finney as Poirot, Martin Balsam as Signor Bianchi, George Coulouris as Dr Constantine, and Richard Widmark as Ratchett/Cassetti, with the remaining cast suspects including Sean Connery (Arbuthnot), Lauren Bacall (Mrs Hubbard), Anthony Perkins (McQueen), John Gielgud (Beddoes), Michael York (Count Andrenyi), Jean-Pierre Cassel (Pierre Michel), Jacqueline Bisset (Countess Andrenyi), Wendy Hiller (Princess Dragomiroff), Vanessa Redgrave (Mary Debenham), Rachel Roberts (Hildegarde Schmidt), Colin Blakely (Hardman), Denis Quilley (Foscarelli), and Ingrid Bergman, who won the 1974 Academy Award for Best Supporting Actress for her role as Greta Ohlsson. Only minor changes were made for the film: Masterman was renamed Beddoes, the dead maid was named Paulette instead of Susanne, Helena Goldenberg became Helena Grünwald (which is German for "Greenwood"), Antonio Foscarelli became Gino Foscarelli, Caroline Martha Hubbard became Harriet Belinda Hubbard, and the train line's Belgian/Flemish director, Monsieur Bouc, became instead an Italian director, Signor Bianchi. On 16 June 2015, 20th Century Fox hired Kenneth Branagh to direct and star as Poirot in another film adaptation of the story, which was released on 3 November 2017. On 29 September 2016, the studio issued a press release announcing much of the cast, including Johnny Depp as Mr Ratchett, Michelle Pfeiffer as Mrs Hubbard, Penélope Cruz as Pilar Estravados (a Hispanic version of Greta Ohlsson, the name coming from a character in Hercule Poirot's Christmas), Dame Judi Dench as Princess Dragomiroff, Sir Derek Jacobi as Masterman, Leslie Odom Jr. as Dr Arbuthnot, Daisy Ridley as Mary Debenham, Lucy Boynton as Countess Andrenyi, Tom Bateman as Monsieur Bouc, Manuel Garcia-Rulfo as Biniamino Marquez (a Cuban version of Antonio Foscarelli), Josh Gad as Hector MacQueen, Marwan Kenzari as Pierre Michel, Sergei Polunin as Count Andrenyi, Willem Dafoe as Gerhard Hardman, and Olivia Colman as Hildegarde Schmidt. Greta Ohlsson is renamed to Pilar Estravados; the character of Colonel Arbuthnot is combined with Dr Constantine to create Dr Arbuthnot, a sniper who served under Colonel Armstrong in the war and had his medical school paid for by Armstrong; and Monsieur Bouc is changed from the director of the line to the director's nephew. Added was a direct link for Poirot to the Armstrong kidnapping—before Sonia's death, John Armstrong wrote to Poirot for help. Also unlike the book, the kidnapping did not take place on Long Island but in New Jersey, where the Lindbergh Kidnapping took place. Susanne Michel is switched from Pierre Michel's daughter to his sister. Cyrus Hardman poses as an Austrian scientist for part of the film. The last scene also sets up the possibility of Death on the Nile as a sequel. A thoroughly modernised and poorly received made-for-TV version starring Alfred Molina as Poirot was presented by CBS in 2001. This version co-starred Meredith Baxter as Mrs Hubbard and Leslie Caron as the Princess Dragomiroff (renamed Señora Alvarado and portrayed as the widow of a South American dictator). Poirot is portrayed as significantly younger and less eccentric than Christie's detective, and is given a subplot involving a romantic relationship with Vera Rosakoff, who is loosely based on an infrequently recurring character of the same name. The story is updated to a contemporary setting, and four of the suspects (Hildegard Schmidt, Cyrus Hardman, Edward Masterman and Greta Ohlssohn) are deleted, as is Dr Constantine. David Suchet reprised the role of Hercule Poirot in "Murder on the Orient Express" (2010), an 80-minute movie-length episode of the television series Agatha Christie's Poirot co-produced by ITV Studios and WGBH-TV, adapted for the screen by Stewart Harcourt. The original air date was 11 July 2010 in the United States, and it was aired on Christmas Day 2010 in the UK. The cast includes Dame Eileen Atkins as Princess Dragomiroff, Hugh Bonneville as Masterman, Jessica Chastain as Mary Debenham, Barbara Hershey as Mrs Hubbard, Toby Jones as Cassetti, and David Morrissey as Colonel Arbuthnot. The character Cyrus Hardman (the former American police officer turned private detective) has been largely amalgamated with the chauffeur Foscarelli (in as much as regards being the lover of the dead maid) and Dr Constantine (who in the novel is unrelated to the murders) becomes a co-conspirator. The main difference from the novel is the additional element of Poirot's Catholicism being brought to the forefront, and his personal and religious struggle with whether to expose the murderers or let them off the hook, as well as a much darker atmosphere of the film, in comparison with the novel. The interior of the Orient Express was reproduced at Pinewood Studios in London, while other locations include the Freemason Hall, Nene Valley Railway, and a street in Malta (shot to represent Istanbul). A Japanese adaptation was broadcast over two nights in January 2015 on Fuji Television, titled Orient Kyuukou Satsujin Jiken [ja], and it featured several famous actors, including Ninomiya Kazunari, Matsushima Nanako, Tamaki Hiroshi, Kichise Michiko, Nishida Toshiyuki, and Sawamura Ikki. The main character, Suguro Takeru, modeled on Hercule Poirot, was played by actor Nomura Mansai. The first night featured a storyline true to the original text, but set in Japan in 1933. In this version, the train Orient Kyuukou ran from the western city of Shimonoseki to Tokyo, with the train stopped by a small avalanche near Sekigahara, Gifu. The second night was an original story. American playwright Ken Ludwig adapted the novel into a play, which premiered at the McCarter Theatre in Princeton, New Jersey on March 14 2017. The production was directed by Emily Mann, and starred Allan Corduner in the role of Hercule Poirot. The point and click computer game Agatha Christie: Murder on the Orient Express was released in November 2006 for Windows and expanded on Agatha Christie's original story with a new playable central character as Hercule Poirot (voiced by David Suchet) is ill and recovering in his train compartment. 1934, Collins Crime Club (London), 1 January 1934, Hardcover, 256 pp. 1934, Dodd Mead and Company (New York), 1934, Hardcover, 302 pp. c.1934, Lawrence E. Spivak, Abridged edition, 126 pp. 1940, Pocket Books (New York), Paperback, (Pocket number 79), 246 pp. 1948, Penguin Books, Paperback, (Penguin number 689), 222 pp. 1959, Fontana Books (Imprint of HarperCollins), Paperback, 192 pp. 1968, Greenway edition of collected works (William Collins), Hardcover, 254 pp. 1968, Greenway edition of collected works (Dodd Mead), Hardcover, 254 pp. 2011, William Morrow (HarperCollins), Paperback, 265 pp. The story's first true publication was the US serialisation in six instalments in the Saturday Evening Post from 30 September to 4 November 1933 (Volume 206, Numbers 14 to 19). The title was Murder in the Calais Coach, and it was illustrated by William C. Hoople. The UK serialisation appeared after book publication, appearing in three instalments in the Grand Magazine, in March, April, and May 1934 (Issues 349 to 351). This version was abridged from the book version (losing some 25% of the text), was without chapter divisions, and named the Russian princess as Dragiloff instead of Dragomiroff. Advertisements in the back pages of the UK first editions of The Listerdale Mystery, Why Didn't They Ask Evans, and Parker Pyne Investigates claimed that Murder on the Orient Express had proven to be Christie's best-selling book to date and the best-selling book published in the Collins Crime Club series. ^ United States, Department of the Treasury (1935). Catalog of Copyright Entries. New Series: 1934, Part 1, Volume 31. New Series. Washington D C: Copyright Office. p. 213. Retrieved 23 March 2015. ^ Coignard, Jerome (28 February 1934). "Books – and Their Makers". The Brooklyn Daily Eagle. Brooklyn, New York: Everything Brooklyn Media. p. 20. Retrieved 23 March 2015. ^ Cooper, John; Pyke, B A, eds. (1994). Detective Fiction – the collector's guide (2 ed.). London, England: Scolar Press. pp. 82, 86. ISBN 0-85967-991-8. ^ a b Marcum, Steve (May 2007). "American Tribute to Agatha Christie: The Classic Years 1930 - 1934". Retrieved 2 September 2018. ^ Peers, Chris; Spurrier, Ralph; Sturgeon, Jamie (March 1999). Collins Crime Club – A checklist of First Editions (2 ed.). North Lincolnshire, England: Dragonby Press. p. 14. ^ Wagstaff, Vanessa; Poole, Stephen, eds. (2004). Agatha Christie: A Readers Companion. London, England: Aurum Press Ltd. p. 88. ISBN 1-84513-015-4. ^ "Murder on the Orient Express (review)". The Times Literary Supplement. London, England: News UK. 11 January 1934. p. 29. ^ Anderson, Isaac (4 March 1934). "Murder on the Orient Express (review)". The New York Times Book Review. New York City: New York Times Company. p. 11. ^ "Murder on the Orient Express (review)". The Guardian. London, England: Guardian Media Group. 12 January 1934. p. 5. ^ Barnard, Robert (1990). A Talent to Deceive – an appreciation of Agatha Christie. New York City: Fontana Books. pp. 199–200. ISBN 0-00-637474-3. ^ "Binge! Agatha Christie: Nine Great Christie Novels". Entertainment Weekly. No. 1343–44. New York City: Meredith Corporation. 26 December 2014. pp. 32–33. ^ a b Sanders, Dennis; Lovallo, Len (1984). The Agatha Christie Companion. New York City: Delacorte Press. pp. 105–08. ISBN 978-0425118450. ^ Morgan, Janet (1984). Agatha Christie, A Biography. New York City: HarperCollins. pp. 201–04. ISBN 0-00-216330-6. ^ "Agatha Christie's Poirot: Tom Conti, Sophie Okonedo, Paterson Joseph, Rula Lenska & Art Malik star in a new adaption of Murder on the Orient Express". An Audible Original Drama. 21 October 2017. Retrieved 2 September 2018 – via Seen It. ^ Geier, Thom (16 June 2015). "Kenneth Branagh in Talks to Direct Agatha Christie's 'Murder on the Orient Express' (Exclusive)". TheWrap. Los Angeles, California: The Wrap News Inc. Retrieved 11 July 2015. ^ "The Full 'Murder on the Orient Express' Cast Includes Johnny Depp, Daisy Ridley, Michelle Pfeiffer, More (UPDATE)". Moviefone. 29 September 2016. Retrieved 3 October 2016. ^ Busch, Anita; Fleming, Mike Jr (11 November 2016). "Penelope Cruz Joins 'Murder On The Orient Express'". Deadline Hollywood. Los Angeles, California: Penske Media Corporation. Retrieved 11 November 2016. ^ Bamigboye, Baz (3 May 2017). "All back on the Orient Express! Remake of the classic has a stellar cast including Johnny Depp, Michelle Pfeiffer, Dame Judi Dench and Sir Kenneth Branagh". Mail Online. London, England: Daily Mail and General Trust. Retrieved 4 May 2017. ^ Fleming, Jr, Mike (29 September 2016). "Johnny Depp To Star in 'Murder On The Orient Express' At Fox'". Deadline Hollywood. Los Angeles, California: Penske Media Corporation. Retrieved 29 September 2016. ^ N'Duka, Amanda (25 January 2017). "Manuel Garcia-Rulfo Boards 'Murder On The Orient Express'; Vivica A Fox Joins 'The Mafia Aint Dead'". Deadline Hollywood. Los Angeles, California: Penske Media Corporation. Retrieved 27 January 2017. ^ Hipes, Patrick (20 October 2016). "Josh Gad Boards Fox's 'Murder On The Orient Express'". Deadline Hollywood. Los Angeles, California: Penske Media Corporation. Retrieved 20 October 2016. ^ Kit, Borys (27 October 2016). "'Mummy' Actor Marwan Kenzari Joins Johnny Depp in 'Murder on the Orient Express' (Exclusive)". The Hollywood Reporter. Los Angeles, California: Eldridge Industries. Retrieved 27 October 2016. ^ Ritman, Alex (5 December 2016). "Ballet Star Sergei Polunin Lands Roles in 'Murder on the Orient Express,' 'Red Sparrow' (Exclusive)". The Hollywood Reporter. Los Angeles, California: Eldridge Industries. Retrieved 5 December 2016. ^ "Willem Dafoe is latest addition to 'Murder on the Orient Express' all-star cast". AFP Relax. 6 January 2017. Retrieved 7 January 2017. ^ Busch, Anita (5 January 2017). "Willem Dafoe Joins Ensemble Cast Of Fox's 'Murder On The Orient Express'". Deadline Hollywood. Los Angeles, California: Penske Media Corporation. Retrieved 5 January 2017. ^ "Olivia Colman 'gutted' to miss Globes ceremony". BBC News. 9 January 2017. Retrieved 9 January 2017. ^ IMDb profile, imdb.com; accessed 31 January 2015. ^ "Murder on the Orient Express". AgathaChristie.com. Retrieved 8 August 2014. ^ "オリエント急行殺人事件 – フジテレビ" [Orient Express Murder Case - Fuji Television]. フジテレビ. Retrieved 10 March 2016. ^ Gans, Andrew (15 March 2017). "Max Von Essen, Julie Halston, and More Star in Murder on the Orient Express". Playbill.com. Brightspot. Retrieved 25 January 2019. ^ "Murder in the Calais Coach". EBSCOhost. Retrieved 23 November 2012.